Housing is done through the conference registration area. Deusto Residence Hall offers single rooms and a dining room open seven days a week. All rooms have en- suite bathroom with shower, toilet and washbasin, Internet connection, telephone and piped music. A complete set of bed linen and towels is provided each week and rooms are cleaned twice a week. It also has heating, water and electricity services included and residents have washing machines available for use during their stay. No air conditioner is available. Remarks: Booking code: Jesuitas Booking deadline: 1 April 2018. The rate will be applied for booking the four nights from 8 to 11 July. The night of 12 July may be added to the booking but will be charged separately. Booking code: Jesuitas Booking deadline: 1 April 2018. The rate will be applied per night for booking from 8 to 11 July. The night of 12 July may be added to the booking but will be charged separately. Hotel rooms are subject to availability at the time of making a firm booking. Prices are shown in rates per night, with breakfast (VAT included). 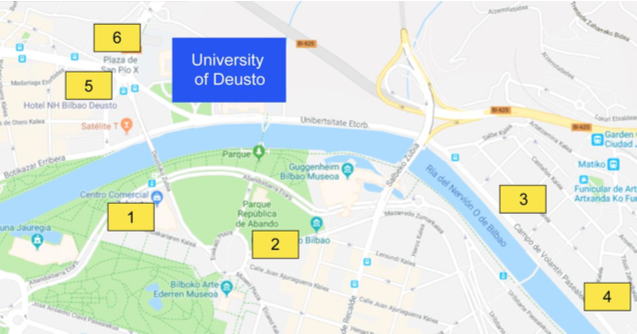 For bookings on days other than the Congress dates (8th to 12th July), please contact the agency directly at deustobio [at] carlsonwagonlit.es. Said bookings will not be eligible at the prices arranged by the Organising Committee. The hotels reserve the right to modify their rates after the booking deadline or room block dates. Bilbao has a wide range of accommodation options besides those that have made agreements with the Congress Organising Committee. Guests may book accommodation ranging from budget hostels and economical hotels to the most exclusive establishments.